Statewide initiatives play a critical role in creating the conditions that enable colleges and universities to make mathematics pathways a reality. Therefore, the Dana Center’s primary strategy for achieving the goal of serving all students is to support systemic statewide work to implement the Dana Center Mathematics Pathways (DCMP) model at scale. The Mathematics Pathways to Completion (MPC) is a major effort to support six states to move from a broad vision for mathematics pathways to institutional implementation of the Dana Center Mathematics Pathways (DCMP) model over three years. The goal is to establish effective mathematics pathways at scale that will dramatically increase student success, modernize entry-level mathematics programs across 2– and 4–year public institutions of higher education, and improve alignment with K­–12 mathematics. The MPC Capstone event was a great time for implementation teams to gather and discuss progress and continuous improvement for mathematics pathways as a part of the Mathematics Pathways to Completion (MPC) project. As a part of this event, several new resources emerged. Check out the 2018 MPC evaluation reportview full resourceDownloadFileWeb, by Community College Research Center. Additionally, a videoview full resourceDownloadVideoWeb of Susan Bickerstaff of CCRC is available, focusing on a discussion of the themes that emerged as a part of evaluating the MPC project. Watch this normative practice videoview full resourceDownloadVideo by Dana Center Manager Amy Getz. This video builds upon our Dana Center Mathematics Pathways: Scaling and Sustaining report. Finally, learn the essentials of telling your mathematics pathways story in an effective and memorable way with this videoview full resourceDownloadVideo, and handoutview full resourceDownloadFileVideo. Creating Structural Change for Student Success: State Mathematics Task Force Accomplishments and Progressview full resourceDownloadFile provides an update of state-level efforts and progress towards increased student persistence and success as a result of implementing multiple mathematics pathways. This report specifically explores examples of innovative approaches to drafting and implementing task force recommendations from thirteen states working in collaboration with the Dana Center. Furthermore, this report provides a synopsis of key focus areas of state-level task force recommendations and concrete examples of customized state-level supports for the sustainability and scale math pathways. As of January 2018, 88 higher education institutions across the MPC states committed to implement mathematics pathways by Fall 2018. This monumental milestone highlights the transition of mathematics pathways from state-level to institution-level implementation. See the new Implementation Connectview full resourceDownloadFile that highlights each MPC state’s major milestones in 2017 and its institutional commitments. The Dana Center utilizes a strategy in which individuals from all levels of the system and from different stakeholder groups collaborate in an effective planning and implementation process in three phases. In Phase 1, faculty leaders from 2- and 4-year institutions work with policy representatives through a state-level math task force to establish a vision for math pathways in that state. This serves to build urgency and motivate change. Phase 2 is a brief transition period during which the math task force establishes goals for scale, plans for implementation and initiates actions to create the enabling conditions for implementation. 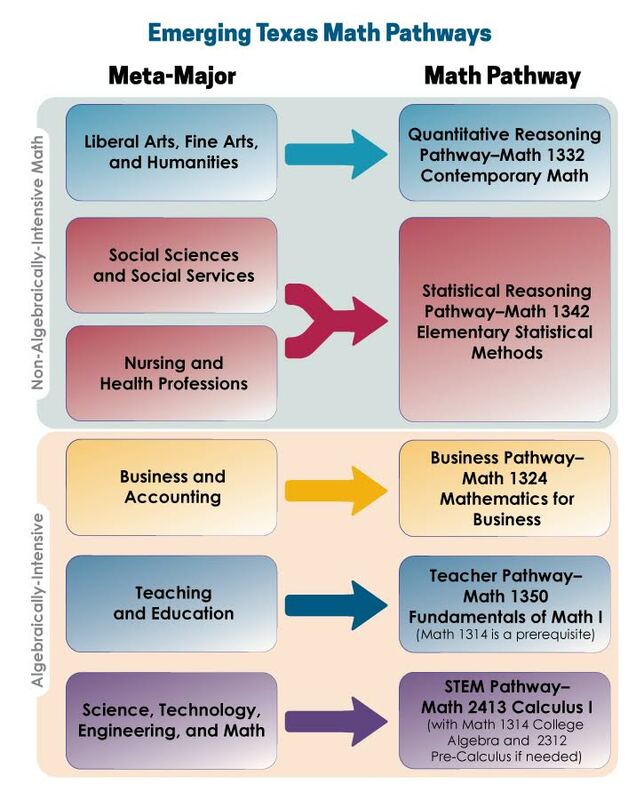 Colleges and universities then move towards institutional implementation of math pathways in Phase 3. Consulting: Each state is paired with a dedicated consultant who will support strategic planning and problem solving. The Dana Center also provides access to experts on specific issues as needed. Leadership Development: The Dana Center provides support to individuals overseeing the state-level work. Tools and Resources: The Dana Center supplies a rich set of tools and resources for state leadership, task force members, faculty, administrators, and other higher education staff. Workshops to Support Implementation: Each state will host a small number of workshops to provide technical assistance directly to colleges, such as helping institutions design mathematics pathways and advisor workshops. In some cases, the Dana Center will facilitate these workshops, and in others, the Center will train local facilitators to customize events to the state context. Each MPC state has a designated lead agency that serves as the hub for the work. Two mathematics faculty co-chairs representing the 2- and 4-year sectors lead the math task force with support from a facilitator at the lead agency. The resources below are organized by activities that occur during phases 1-3 of the MPC process. Additional resources for state-, institution-, or classroom-level activity can be found at Take Action.